Tropical Cyclone Debbie made landfall in Queensland bringing heavy rainfall, hurricane-force winds, rough seas, and flooding. NASA-NOAA's Suomi NPP satellite provided a visible look at the storm from space while NASA's Aqua satellite analyzed cloud temperatures to determine the location of the strongest storms within. Before Debbie made landfall, NASA's Aqua satellite analyzed the temperatures in the storm on Mar. 27 at 0347 UTC (Mar. 26 at 11:47 pm. EST). 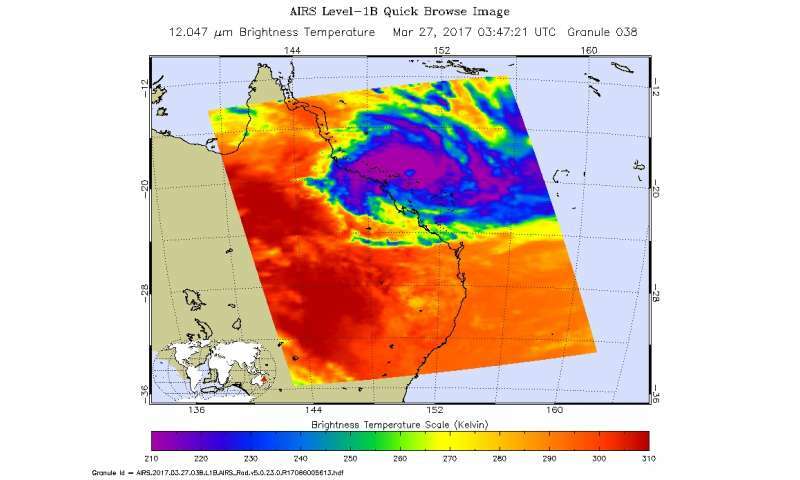 The infrared imagery showed a large area of cloud top temperatures in thunderstorms around Debbie's eye as cold as near minus 63.1 degrees Celsius or minus 81.6 degrees Fahrenheit. Cloud top temperatures that cold have been shown to produce heavy rainfall. Cyclone Debbie made landfall north of Proserpine at Airlie Beach on March 28, shortly after noon AEST/Queensland local time (0200 UTC/March 27 at 10 p.m. EST). The Australian Bureau of Meteorology noted wind gusts stronger than 160 mph (260 kph) were recorded near landfall. The strong winds downed trees and powerlines. Power losses occurred in a large area between the towns of Bowen and Mackay, according to Ergon Energy. The Townsville airport and ocean ports were closed. Shortly after Debbie's 30-mile-wide (50 km) eye made landfall, the VIIRS instrument aboard NASA-NOAA's Suomi NPP satellite captured a visible image of the storm at 03:42 UTC (1:42 p.m. AEST Queensland local time /Mar. 27 at 11:42 p.m. EST). The image showed a thick band of powerful thunderstorms wrapped around the cloud-filled eye. At 11:58 p.m. AEST/Queensland local time (9:58 a.m. EST/U.S. 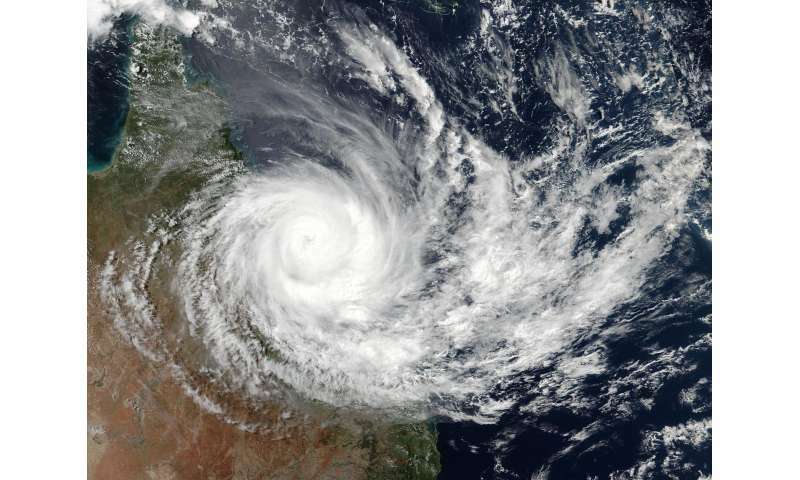 ), the Australian Bureau of Meteorology (ABM) noted that the Warning Zone extended from Bowen to St Lawrence, including Mackay and the Whitsunday Islands, and extending inland to Mount Coolon and Moranbah. At that time, ABM noted that maximum sustained winds near Debbie's center were near 52.8 mph (85 kph) with higher gusts. Debbie was centered near 20.8 degrees south latitude and 147.5 degrees east longitude, about 71.4 miles (115 kilometers) west southwest of Proserpine and 24.8 miles (40 kilometers) southwest of Collinsville. Debbie continued to move inland in a west-southwesterly direction at (9.3 mph) 15 kph. ABM noted "Tropical cyclone Debbie is expected to weaken further to a tropical low during the next few hours. During the day today, this remnant low will curve from the current southwesterly motion to a more southerly track over inland Queensland. Although the peak winds near Debbie's center are weakening rapidly tonight, heavy rainfall is expected to continue across the region for the next 12 to 24 hours, gradually contracting southwards with the system." For additional updates from ABM, visit: http://www.bom.gov.au/cyclone/index.shtml. Cyclone Debbie was the most powerful storm to make landfall in Queensland since Cyclone Yasi in 2011.